LIANE Horiuchi dreamed about playing for the Hawaii Rainbow Wahine softball team in front of her family. She was recruited by UH, BYU, California and UCLA, but made just one official visit -- to Tennessee. "Once I visited here, I decided to commit. I like the atmosphere. It is easy to be recognized on the street and you get support from the fans," said Horiuchi, the Lady Vols' starting shortstop. "I wanted to compete for a national championship. That was important for me and I knew Tennessee would have a good shot." She made her recruiting trip in November, but didn't realize how cold it could be that time of the year. "I wore slippers to the football game. One of the football coaches called me twinkle toes," said Horiuchi. 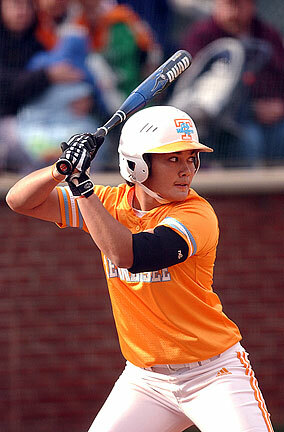 When she arrived in Knoxville in the fall of 2005, the Lady Vols' second base position was up for grabs. "I knew the SEC (Southeastern Conference) was very challenging. The hardest part was I didn't know what to expect. My goal coming in was to be in the starting lineup," Horiuchi said. Tennessee co-head coach Ralph Weekly said, "We had some talented kids with good prep records on the mainland, but Liane beat them out. She is one of the most fluid defensive players I've ever seen in my life. She is extremely fundamentally strong, very quick and has a great mind." 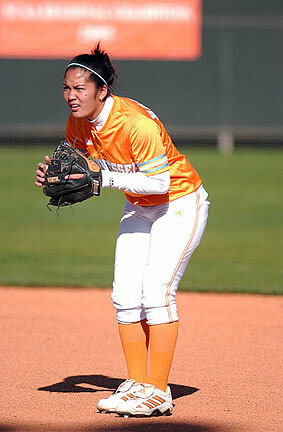 Horiuchi fashioned a .273 batting average in 71 games for the Lady Vols last year. She also was hit by a pitch 18 times, good enough for second place on the all-time UT list. She capped her season by being selected to the SEC All-Freshman team. Her biggest adjustment was hitting. "Hawaii is not exposed to the kind of pitching you see at this level. It is so much faster," Horiuchi said. "There is a lot of fine-tuning every day. There were times when I had my ups and down, but if you work hard at it, you come out of it." The Lady Vols finished with a nation-best 61 wins and came in third in the NCAA tournament. This year, Horiuchi moved to shortstop. Her average is down and Weekly had a one-on-one session with her last Monday. "It is in my stance, deciding whether to step or not stride. I've shortened my stance to keep my weight back," Horiuchi said. "Liane is a shortstop who will field 1.000, hit .250, but she will come up with the big hit," Weekly said. "I can honestly say she is a coach's dream. She gives 150 percent at practice, is always on time, is a 4.0 student and she never causes me any concern." Horiuchi was joined in January by Anita Manuma (Campbell '06), a teammate on club team Mililani Prep , who Weekly has been working at third base. "Anita was a little behind the power curve and a little out of shape coming in January, but she is going to be a big-time player," Weekly said. "She is learning the system and catching up with the pitching. She hit her first home run last week. I think she is going to see more playing time." Weekly, who spent six years in the Air Force at Hickam, thinks it is something that his two Hawaii recruits could soon be playing side by side in the infield. "I'm a believer in Hawaii and their athletes because of their warrior attitude. You don't always see that," Weekly said. "They don't expect things to be handed to them. They want to fight for everything they get. They are tough-minded, not afraid to get in a scrap." Before Manuma arrived, Horiuchi filled her in on what it was like to be at Tennessee. "I'm glad someone is here who understands when I use local phrases," Horiuchi said. "Last year my teammates used to call me the foreigner, but I think Anita has taken over that designation." Last weekend, the top-ranked Lady Vols (25-2) opened the SEC season at Florida by winning two of three games. Wednesday they split a road doubleheader with Mississippi. Weekly likes to tell the story about the first time Horiuchi saw her breath in the air. "She just kept blowing her breath out to see it, but she has adapted really well," Weekly said. "Both of them are really popular and go with the flow. They are polite and respect authority and you don't always get that. It is a credit to the way they were raised. "Liane's mom (Diane Pedro) taught my wife (co-head coach Karen) how to cook sticky rice. We have a Hawaiian thing with the team about every other month." Horiuchi began playing softball in elementary school. She already had some experience with a ball, having played baseball with brother Lance. "That helped when it got to softball," said Horiuchi, who also took a positive experience away from soccer. "I started with soccer and I was shy. Just the experience of interacting with the other players helped me a lot." Horiuchi (Kamehameha '05) joined Mililani Prep in seventh grade and tried a year of track at school to help with her running and speed. A former center fielder, she was moved to the infield in high school. "It was an adjustment. You have to react faster, but I was getting bored in the outfield. Being right behind the pitcher was more exciting," said Horiuchi, who played mostly second base for the Warriors. YEAR G AB R H 2B 3B HR RBI SB AVG. » Want an autograph with that?